With autumn and Halloween quickly approaching, it’s time to celebrate the fun of pumpkins! 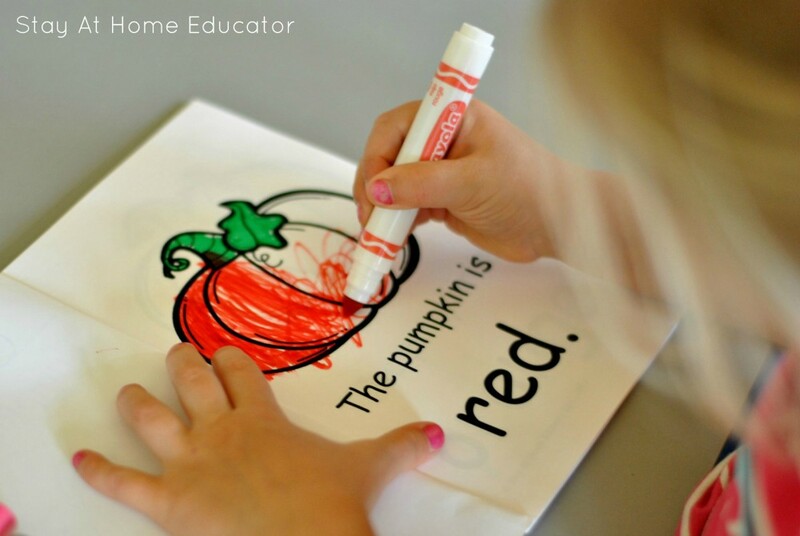 What better way than to begin with these pumpkin color recognition and activity booklets. And best of all, these are free fall printables! 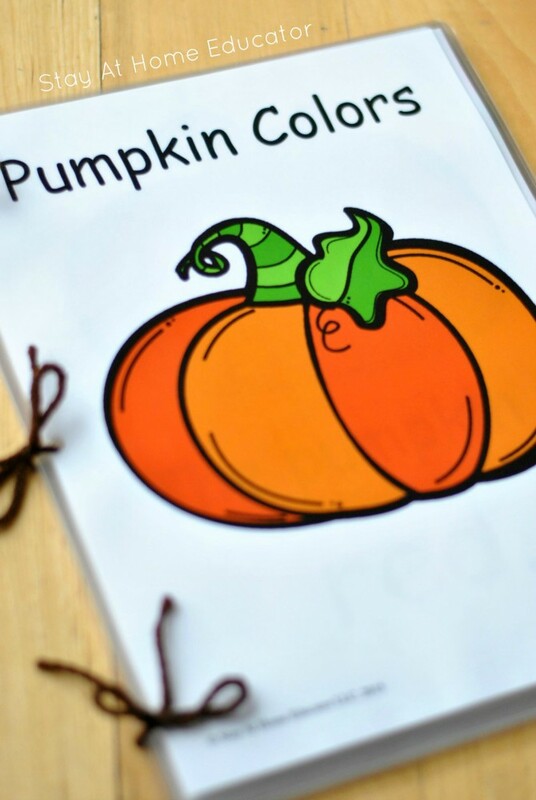 This pumpkin colors booklet and class book is the perfect thematic way to teach preschoolers and kindergartners color recognition, as well as color sorting and counting, all the while encouraging emergent reading skills! 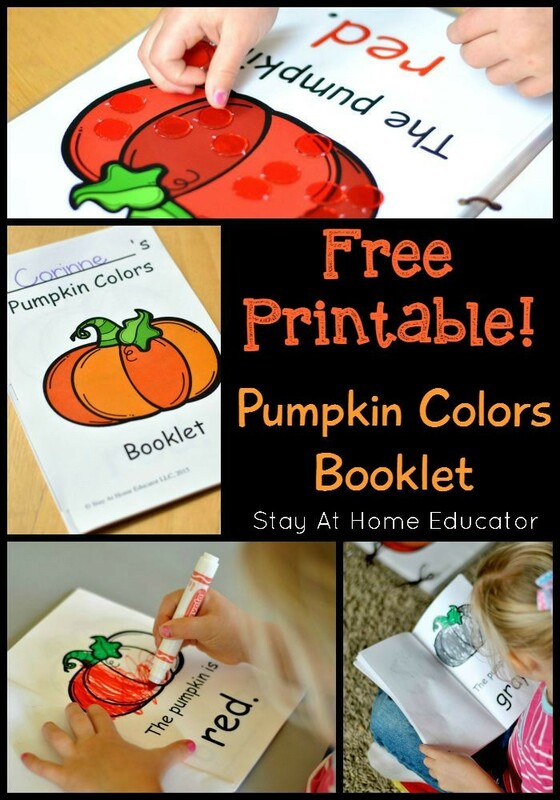 With just one printable, (ok, technically two) children can color, read and practice several math skills all while enjoying a favorite topic…Pumpkins! I included a full color version of the booklet because I wanted to read it to my preschool class before we made our own booklets. Aside from just reading the class book, there were several activities that resulted in having a big, full color version available. Because of the repetitive text, the book is predictable, making it easy for young readers to “read” to themselves. The free pumpkin printables are available in a link at the end of this post. I printed out each page in full, and in color, at my local print shop. Then I laminated the pages, and assembled the books by hole punching the pages and tying the whole thing together with some yarn. After reading it to Corinne, I asked her to “read” it back to me, which she gladly did. Because I love how inviting the orange pumpkin is on the first page of the book, I printed the first page in of the booklet in color, too. The rest of the book is in black and white, because it is meant to be colored in. I organized the pages in the order they are written, and then stapled them to make a booklet. I presented it to Corinne with a set of markers. And she quickly got to work coloring in the pumpkins. While I was available to help her, should she ask, Corinne instead used the big book version as a reference. he can’t read color words yet, but she can match many words by the way they look and their beginning letter. That’s the strategy she used here. When she turned to the first page in her booklet, she looked for the same page in the big book. She knew she found the matching page where she saw that the words matched. Corinne was so excited to have a book “like Williams little books” (decodables) that when she finished her coloring she sat down to read her booklet. She was so proud of reading her new pumpkin book! Again, because of the predictable text, it felt like she really was reading, which was so encouraging to her! Using a set of color counters, we practiced some color matching and sorting activities using the full color big book. As a result of many activities like this one, Corinne counted the “pumpkins” (counters) as she placed them on the pumpkin in the book. 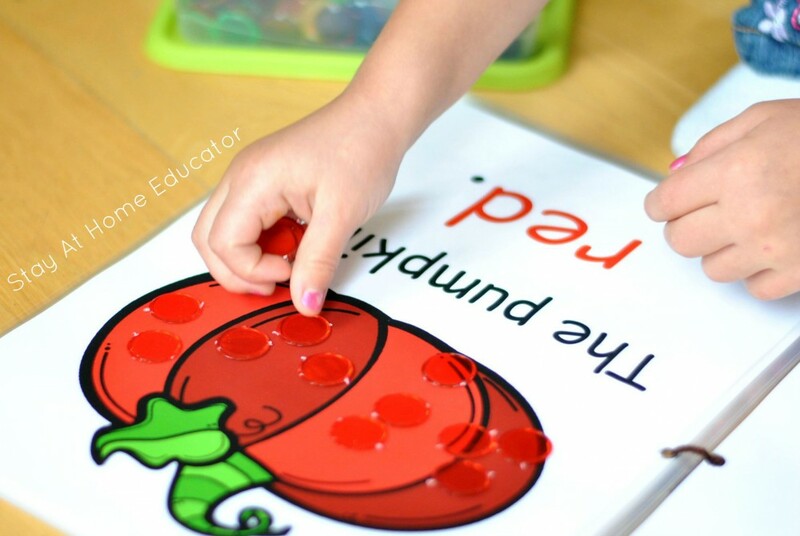 It seems like fall of a favorite season among preschoolers, and these free fall printables are a great way to kick off all that fall, apple and pumpkin learning fun we look forward to so much throughout the year. If you would like these free fall printables, you can download them by clicking the image below. Looking for more fall ptintables and activities? Be sure to check out all these other brilliant fall activities! Where is the link for the printables? I don’t see it…. Um, I’m feeling kinda’ silly…I forgot to add the link. I’ve corrected that now. They are under the heading “Fall Free Printables.” Sorry.